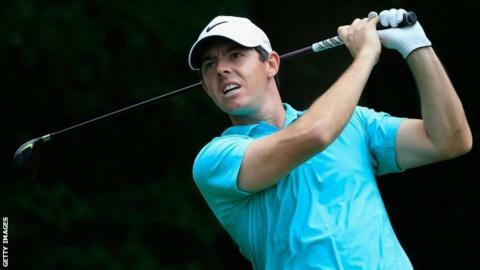 Rory McIlroy and Paul Casey are well placed after the opening round of the Tour Championship in Atlanta. Swede Henrik Stenson shot a seven-under 63 to lead by two shots from Englishman Casey, with Northern Ireland's McIlroy one stroke further adrift. World number one Jason Day finished on one under after day one of the PGA Tour's season finale. Day is one of five players for whom victory would also mean they win the FedEx Cup, and with it a £6.6m bonus. Stenson is another, with Americans Jordan Spieth, Rickie Fowler and Bubba Watson making up the quintet. Spieth opened with a two-under 68, Fowler shot a 69 and Watson began with a 70. With McIlroy, Spieth, Day and Fowler all aged less than 28, Stenson joked that he felt part of their generation of young stars. "It feels good to be part of that wave," said the 39-year-old, who has not won a title this year. "When you reach my age and you hit however many millions of golf balls I've done over the years, the body definitely feels it. "It gives satisfaction when you're on top of the leaderboard in any tournament. It's been a lot of Jason and Jordan and Rickie and Rory, so of course it's good to get a good start." The Tour Championship is the last of the four FedEx Cup play-off events, with a field of 30 having been whittled down from the 125 who competed in the first. McIlroy is 11th in the FedEx Cup standings, and needs to win and hope the five main contenders finish down the field. He recovered from a bogey at the second with a hat-trick of birdies from the seventh. Stenson, who is looking to win the FedEx Cup for the second time in three years, birdied the first three holes, picked up another shot on the sixth and eagled the ninth, 10th and 12th. Casey had set an early clubhouse target of 65 in a round featuring six birdies and one bogey. South Africa's Louis Oosthuizen, meanwhile, had to withdraw after 13 holes because of a hamstring injury.